In a world full of fancy semi auto pistols, it is easy to forget the venerable .38 Special. Federal hasn't though, and keeps this revolver cartridge more relevant than ever with their LE Tactical Hydra-Shok .38 special ammo. Packing a heavy 147 grain bullet moving at 950 feet per second, and generating a hammering 295 foot pounds of energy, this +P+ rated ammo is loaded in nickel plated reloadable brass cases, and packed in handy fifty round boxes. Hydra-Shok bullets were designed in the late 1980's when the FBI sought a superior hollowpoint with more reliable expansion and better ballistics than were available at the time. Today, Hydra-Shok bullets are renowned for their predictable, controlled expansion, and excellent terminal performance. 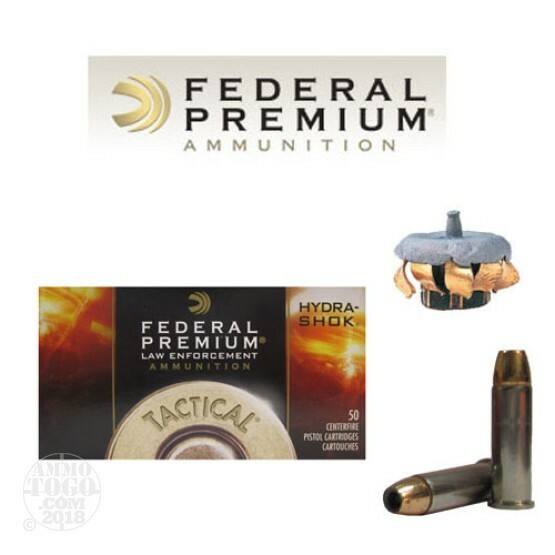 Federal LE Tactical ammo is intended for regular carry or duty use, and is ideal for those who want to give their classic .38 Special revolvers a real edge, or who know they need the most reliable performance from a small backup gun. Whatever your reason for choosing Federal LE Hydra-Shok ammo, you can rest assured that it represents decades of careful research and manufacturing excellence. WARNING! This ammo is high pressure +P+ rated, and should only be used in modern revolvers in good repair and rated for high pressure ammo. Do not use in .38 special revolvers not specifically rated for this type of ammo. It is of course safe to use in any .357 magnum revolver.